For other people named similarly, see Phillip Johnson. The amount of power he yearned for was inversely proportional to the amount he actually attained. In politics, he proved to be a trifler, the dilettante he earlier feared himself to be, a model of futility who sought to find a messiah or to pursue messianic ends but whose most lasting following turned out to be the agents of the FBI—who themselves finally grew bored with him. In short, he was never much of a political threat to anyone, still less an effective doer of either political good or political evil. In the same period, Johnson won commissions to coordinate the master plan of Lincoln Center, New York City's new arts center, and to design that complex's New York State Theater, built in a massive and unadorned modernist style. He also undertook his first foreign commission, the modernist art museum in Bielefeld, Germany, with a modernist facade clad in dark red stone, and a modernist colonnade of slender pillars (1968). In the late 1970s Johnson applied landscape architecture to two significant projects in Texas. The Fort Worth Water Gardens opened in 1974, creating an urban landscape where visitors experience water in distinct ways. And in 1977 Johnson completed the spiraling white chapel and meditation garden at Thanks-Giving Square in Dallas. 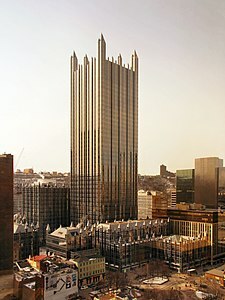 PPG Place in Pittsburgh, Pennsylvania, (1984). 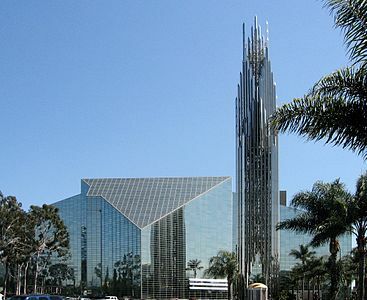 In 1980, Johnson completed a new building in a startling new style; The Crystal Cathedral in Garden Grove, California, a soaring glass neo-Gothic megachurch for the Reverend Robert H. Schuller. It became a Southern California landmark. In 2012 it was purchased by the Roman Catholic Diocese of Orange to become the cathedral for Orange County. "Da Monsta" the gatehouse of his Glass House residence (1995). In 1986 Johnson and Burgee had moved their offices into one of their new buildings, the Lipstick building, the popular name of the skyscraper they built at 885 Third Avenue in New York, and given its nickname because of its resemblance to the color and shape of a stick of lipstick. Burgee, who wanted to play a larger role in the firm negotiated a smaller part for Johnson, and in 1988 the firm's name was changed to John Burgee Architects with Philip as the design consultant. By 1991 Johnson had split with Burgee and opened up his own practice. Working with John Burgee, Johnson did not confine himself to a single style, and was comfortable mixing elements of modernism and postmodernism. For the Cleveland Play House, he built a romanesque brick structure; for the Architecture School at the University of Houston, he said that his model was the French neoclassical architecture of the 18th-century architect French Claude-Nicolas Ledoux. 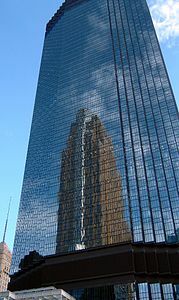 His skyscrapers on the 1980s were skillfully constructed and clad in granite and marble, and usually had some feature borrowed from historic architecture. In New York he designed the Museum of Television and Radio, (now the Paley Center for Media) (1991). In his will Johnson left his residential compound to the National Trust for Historic Preservation. It is now open to the public. Johnson's publicly held archive, including architectural drawings, project records, and other papers up until 1964 are held by the Drawings and Archives Department of Avery Architectural and Fine Arts Library at Columbia University, the Getty, and the Museum of Modern Art. He is mentioned in the song "Thru These Architect's Eyes" on the album Outside (1995) by David Bowie. Philip Johnson's Glass House, along with Mies van der Rohe's Farnsworth House, was the subject of Sarah Morris's 2010 film Points on a Line. Morris filmed at both sites over the course of several months, among other locations including The Four Seasons Restaurant, the Seagram Building, Mies van der Roheʼs controversial 860–880 Lake Shore Drive Apartments, and Chicagoʼs Newberry Library. ^ a b Goldberger, Paul (May 23, 1979). 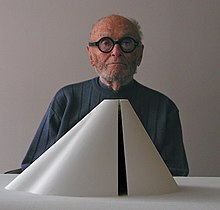 "Philip Johnson Awarded $100.000 Pritzker Prize: Retrieved August 1, 2011. ^ Forms Under Light | The New Yorker Retrieved 2018-05-25. ^ a b c d e f g h i Goldberger, Paul (January 27, 2005). "Obituary: Philip Johnson, Architecture's Restless Intellect, dies at 98". The New York Times. Retrieved 15 May 2018. ^ a b c Saval, Nikil (12 December 2018). "Philip Johnson, the Man Who Made Architecture Amoral". Newyorker.com. Retrieved 12 December 2018. ^ a b c d e Wortman, Marc. "Famed Architect Philip Johnson's Hidden Nazi Past". Vanity Fair. Retrieved 12 December 2018. ^ a b c Taschen 2016, p. 314. ^ a b c Schulze, Franz (1996). Philip Johnson: Life and Work. Chicago: University of Chicago Press. ISBN 978-0-226-74058-4. Retrieved 15 May 2018. ^ a b c Varnelis, Kazys, Cornell University (November 1994). "We Cannot Not Know History: Philip Johnson's Politics and Cynical Survival". Journal of Architectural Education. Association of Collegiate Schools of Architecture, Inc. 49 (2): 92–104. doi: 10.2307/1425400. Archived from the original on November 8, 2010. Retrieved 29 January 2013. ^ a b c Geva, Anat. "An Architect Asks For Forgiveness: Philip Johnson's Port Chester Synagogue" (PDF). Symposium of Architecture, Culture and Spirituality. ACS Forum. Retrieved 2014-06-17. ^ Cahill, Frank M.; Harrington, Cleo M. (2 March 2017). "If Only We Could See It: Philip Johnson's Mystery House". The Harvard Crimson. Retrieved 17 May 2018. ^ Sisson, Patrick (20 August 2015). "21 First Drafts: Philip Johnson's 9 Ash Street House". Curbed. Retrieved 17 May 2018. ^ Harvard University Town Gown Report (PDF) (Report). Harvard Planning Office. 2016. p. 15. Retrieved 17 May 2018. ^ "PHILIP JOHNSON". IDS Center. Retrieved January 29, 2015. ^ "Four Seasons & Brasserie Restaurants, Seagram Building, NYC". NYIT Architectural History. YouTube. May 4, 2012. Retrieved January 29, 2013. ^ Taschen 2016, pp. 315–317. ^ Taschen 2016, pp. 315-317. ^ a b Taschen 2016, pp. 314–317. ^ "Music Academy is Architect's Finale". Los Angeles Times. Retrieved 2017-04-11. ^ "USA Architects to Design Renovations to the Pennsylvania Academy of Music Building". Usaarcitects.com. Retrieved 2017-04-11. ^ Schulze, Franz (1996). Philip Johnson: Life and Work. University of Chicago Press. p. 93. Retrieved 4 October 2017. ^ Kennedy, Randy (June 14, 2005). "David Whitney, 66, Renowned Art Collector, Dies". The New York Times. Retrieved May 11, 2009. ^ Bourdon, David (May 1970). "What's Up in Art, The Castelli Clan". Life. Accessed June 9, 2010. ^ a b George Haggerty, ed. (2000). Gay Histories and Cultures: An Encyclopedia. 2. Taylor & Francis. p. 498. ISBN 9780815318804. ^ Saval, Nikil (2018-12-12). "Philip Johnson, the Man Who Made Architecture Amoral". ISSN 0028-792X. Retrieved 2019-02-12. ^ Stern, Robert A. M. (May 2005). "Philip Johnson: An Essay by Robert A.M. Stern". Architectural Record. Archived from the original on 7 May 2005. Retrieved August 12, 2010. ^ Wortman, Marc (April 4, 2016). "Famed Architect Philip Johnson's Hidden Nazi Past". Vanity Fair. Retrieved 15 May 2018. ^ "Film and Architecture 'My Architect'". Retrieved June 24, 2015. Wikimedia Commons has media related to 21st-century architecture. Schulze, Franz (1996). Philip Johnson: Life and Work. Chicago: University of Chicago Press. ISBN 978-0-226-74058-4. Retrieved 15 May 2018. Taschen, Aurelia; Taschen, Balthazar (2016). L'Architecture Moderne de A à Z (in French). Bibliotheca Universalis. ISBN 978-3-8365-5630-9. Prina, Francesca; Demaratini, Demartini (2006). Petite encyclopédie de l'architecture (in French). Solar. ISBN 2-263-04096-X. Hopkins, Owen (2014). Les styles en architecture- guide visuel (in French). Dunod. ISBN 978-2-10-070689-1. De Bure, Gilles (2015). Architecture contemporaine- le guide (in French). Flammarion. ISBN 978-2-08-134385-6. Tomkins, Calvin (May 23, 1977). "Profile of Philip Johnson". [ clarification needed] The New Yorker. Wikimedia Commons has media related to Philip Johnson. Philip Johnson architectural drawings, 1943-1994 (bulk 1943-1970). Held by the Department of Drawings & Archives, Avery Architectural & Fine Arts Library, Columbia University.